Funny (and well executed) online quiz where you decide if these famous quotes where from Jesus or Mariah Carey. The One Pager features a changing background gradient, lovely load transitions and a subtle pixel snowfall effect. When you REALLY think about it, Christmas is about two people: Jesus Christ and Mariah Carey. One is the son of God, the other is an American singer with 8 Jack Russells and a 5 octave range. But which of these two seasonal superstars is responsible for the following quotes? Let's play Mariah or Messiah! Designed and built by Neverbland​, a digital product studio based in Soho, London. Neverbland are the studio behind startup successes B​ ulb.co.uk​, ​Everpress and ​Jukedeck. 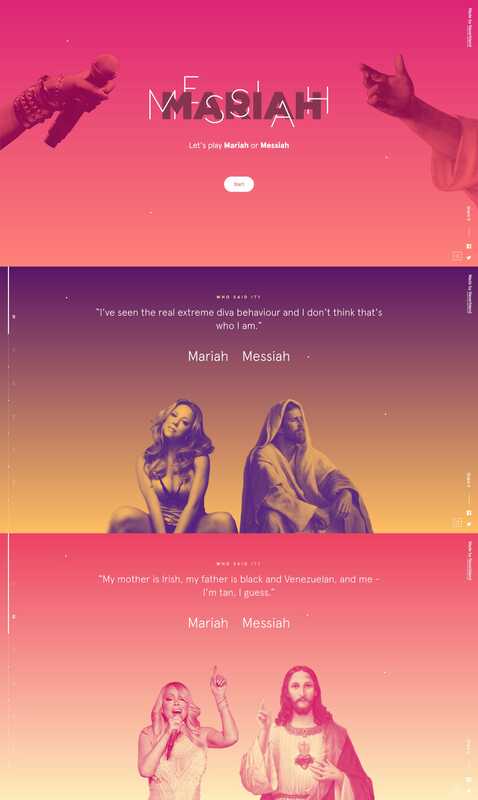 Mariah or Messiah was built using React, Redux, CSS and HTML.